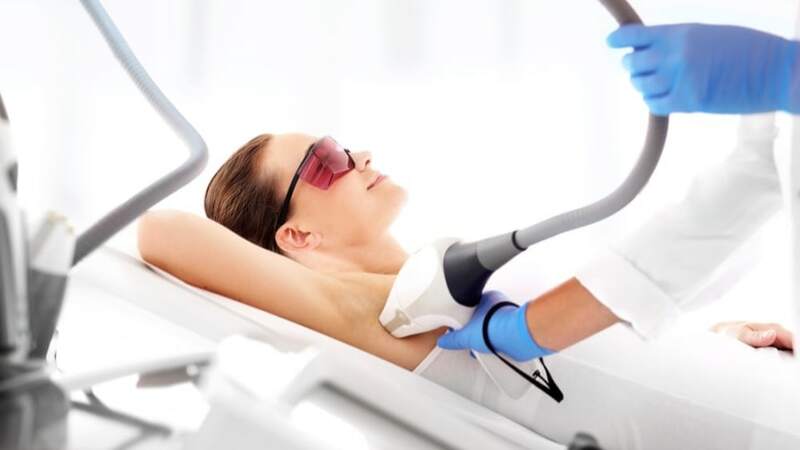 April 2, 2019Laser Hair Removal vs. Electrolysis: What's The Difference? Permanently removing unwanted body hair is more affordable and easier than ever before. But before you throw away your razors and cancel your wax appointment, you need to decide which method of hair removal is best for you. We interviewed board-certified dermatologist Jeanette Black, MD to what the differences are between the two most popular methods: laser hair removal and electrolysis. Believe it or not, laser hair removal is one of the most common cosmetic procedures in the US. Laser hair removal, which is a similar technique to IPL (Intense Pulsed Light) but is not the same, works by pulsating highly concentrated light deep into the skin, which is then absorbed by the hair’s pigment. This creates heat which kills the hair follicle, preventing further hair growth. Treatments are scheduled around the hair growth cycle, which is why sessions are scheduled every four to six weeks. When the hair is in its active growth cycle, it absorbs more of the laser’s light, which in turn creates sufficient heat to destroy the follicle. Each session targets new follicles until most of the hair has been destroyed. While it is not mandatory, some patients find taking ibuprofen an hour before the treatment can reduce the pain. If you are especially sensitive to pain, you can even apply a numbing solution to your skin ahead of time, just make sure to run it by the clinician first. The energy in the laser is attracted to the follicle pigment, which means hair removal works best for patients with darker hair. The ideal laser hair removal patient has fair skin with darker hair. That is not to say that people with blonde hair cannot see benefits from laser hair removal, but those people might be better off with specific lasers like Diode or Ruby that are specifically designed for people with less pigmentation. As for people with darker skin, they are not recommended to use laser hair removal therapy since the lasers cannot distinguish the pigment in the hair follicle from the pigment in the skin. As a result, the laser can possibly cause permanent discoloration. Since complexion is a critical factor of the success of the treatment, it is important to get a consultation to discuss your specific skin tone and hair color. If laser hair removal is not for you, they may be able to refer you to a different treatment that would be more suitable for your coloring. Regardless of your complexion, it is important to note that results are not always guaranteed. Some people see hair regrowth after several months or years whereas others never have to pick up a razer again. After each session, it will take about two weeks for the targeted hair to fall out. While you will see results after your first treatment, it typically takes around six sessions to see significant reduction. “If the skin is more pigmented, the laser settings will need to be decreased for safety reasons and this may mean that the patient will require more treatment sessions,” Dr. Black says. Most report seeing about a 75% reduction in hair growth after six sessions. That said, the procedure does require maintenance. For best results, it is advised to go in for additional sessions once a year for the first few years. What to consider when choosing the salon or clinic? When it comes to cosmetic procedures, price is obviously an important factor, but it should not be the only one. Depending on the area you are looking to treat, laser hair removal can cost anywhere from $100 to $2,00 per session, not including tax. Do your due diligence when researching and remember that you should only work with a board certified dermatologist or a licensed technician. Electrolysis is another type of hair removal procedure that disrupts hair growth. Unlike laser hair removal, electrolysis is considered a permanent solution, according to the FDA. Instead of light, it relies on shortwave radio frequencies. A device called an epilator, which is a very fine needle usually thinner than a strand of hair, is placed into the skin through the natural opening of the hair follicle. The epilator emits a small electrical current to destroy the follicle and prevent growth. Each session lasts from 15 minutes to one hour, depending on the size of the area being treated. Like laser hair removal, electrolysis can provoke mild pain or discomfort. Many patients have described the sensation as a prick or a shock. Precautionary measures are the same as laser hair removal where patients can take ibuprofen or apply numbing cream ahead of time. The biggest difference between electrolysis and laser hair loss is the number of sessions required. Electrolysis is a big commitment. Depending on the area and the person, some patients may need up to 30 sessions to remove all hair. Since electrolysis uses radio frequencies rather than light, it does not rely on pigment. Instead it attacks the follicle itself, making it a viable option for all types of complexions. However, it should be warned that previous tweezing and waxing can make the process a little more difficult. Tweezing and waxing can alter the shape of hair follicles, making it harder to get the epilator into the root. Additionally, electrolysis is only for the committed since it can take around a year and a half to see full results. Talk to your technician ahead of time to understand what you can expect. Like laser hair removal, electrolysis depends on the hair growth cycle. “As only one hair can be treated at a time with electrolysis, the number of treatments required depends on many factors including the amount of hair being treated, the speed of the technician, and the thickness of the hair,” says Dr. Black. “Large areas with dense hairs may require more time to treat and this might mean that these areas are broken into several treatment sessions.” However, once the unwanted hair is gone, it is gone forever. Because so many sessions are required for electrolysis, prices run lower than laser hair removal. Depending on the area, each session can range from $30-$200. As with any other cosmetic treatment, it is critical that you work with a board certified dermatologist or trained technician. Always ask for a consultation before committing to a treatment plan.